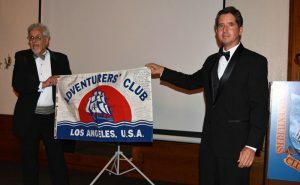 Carrying the Adventurer’s Club of Los Angeles’ Expedition Flag represents an almost 100 year old tradition of Members documenting off the beaten path adventures. It is considered a distinct honor and privilege to carry the ACLA Expedition Flag, and as such, it is treated with great respect, and certain criteria needs to be met. To be eligible to carry the Expedition Flag one must be a Member in good standing and be prepared to organize all the logistics of the trip themselves or as part of a larger expedition. The underlying intent is “off the beaten path adventures into little known and inaccessible parts of the world for purposes of acquiring useful knowledge for the benefit of exploration, scientific interests, treasure hunting and/or high adventure”. Guided group trips such as a cruise ship, photo safari based out of a lodge, a rafting trip down a popular river and other similar organized tours are not eligible for carrying the Expedition Flag. We do have smaller versions of the Expedition Flag for such trips that don’t require an application. They are available for sale at any club meeting and make for great photo ops in the field. Kindly fill out the request in full before emailing, land mailing or bringing it to the club in person.